“Bertie clearly wanted to get a lot off his chest"
Mary O’Rourke has revealed her thoughts on Bertie Ahern’s comments about Brian Lenihan. 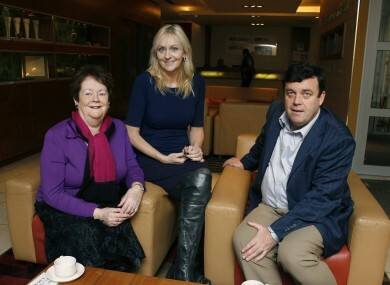 Mary O'Rourke and Brian Lenihan with RTÉ's Miriam O'Callaghan. FORMER FIANNA FÁIL minister Mary O’Rourke has given her verdict on Lenihan: A Legacy - a documentary aired on RTÉ last night. The programme focused on the late finance minister Brian Lenihan, O’Rourke’s nephew. She said watching the documentary was emotional. “I was very nostalgic and I was filled with emotion, but I was lucky to have a family to go to and to be with them – that meant a lot to me. During the course of the documentary, former Taoiseach Bertie Ahern described Lenihan as “difficult”, claiming he didn’t want to knock on doors other than in Castleknock. “The more intellectual the are, the more work they don’t want to do,” Ahern said. Bertie was a pint man, and your local man, and I know all that life myself. But I just think that he kind of feared things. He said that Brian liked poetry and things like that, but so what? Lots of us like poetry, but you can still knock on doors. O’Rourke added that Ahern was “in his own way … fine”. I dared to hope he would live … the world lay before him. I like to think this, he’ll be regarded as a good guy… He was a patriot as well, but I don’t expect everyone to agree with me. Lenihan died on 10 June 2011. Overall, O’Rourke said she and her family found the documentary to be “very positive” and “very balanced”. Email ““Bertie clearly wanted to get a lot off his chest"”. Feedback on ““Bertie clearly wanted to get a lot off his chest"”.